There's nothing not to like about this coffee cake/dessert! You can change up the fruit to your liking. It's easy to make . . . a combination between a Platz and a cobbler. Another recipe from my mom. Grease 9x12 or 10 inch round spring form pan. If you want to be able to lift out rectangular shaped cake, line pan with parchment paper. Mix dry ingredients and cut in butter with pastry blender, till crumbly. In a separate small bowl, beat eggs with fork, stir in buttermilk and vanilla. Add wet ingredients to dry ingredients, stirring to moisten. Divide batter, spreading just over half of it (about 2/3) into greased pan. Using a teaspoon, dot the rest of the batter over the fruit. Make crumb topping, using pastry blender, and sprinkle over cake. Bake at 350° F for 45 - 50 minutes. That looks so yummy I almost tried to lick my screen for a taste! YUM! Oh my....I would love a piece of that right now with my coffee....but I'll eat my oatmeal now and bake this up some other time. First of all, the comment by Lois made me laugh out loud this morning! This looks wonderful! I'm making this recipe over the weekend for sure. Thanks for posting it! Love the way it looks, making this for my hubby. I needed a dessert idea for my company tomorrow. This will fit the bill perfectly. Your/your Mom's recipes are always winners. I like the visual learner. I like step by step instructions with pictures. Thanks for sharing. Sounds yummy and I LOVE your mosaic for the visual learner! Looks so good..I would have liked some with my coffee this afternoon. Oh yum. Two of my favorite fruits in one place!! Before I even scrolled down I just knew that was a 'dish' by Anneliese. I made this yesterday and we loved it. I was going to freeze some of it but it's too good. Thanks for sharing this yummy recipe. That looks delicious! 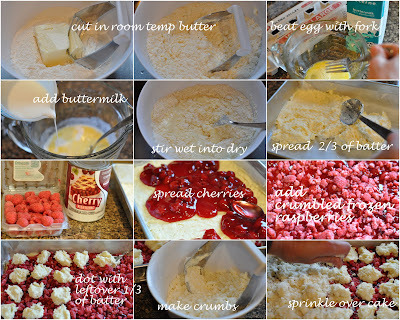 I love cherries and raspberries and coffee cakes, so it has to be good. I made this last night - it is soooo delicious - and easy. Hubby couldn't get enough of it. Thanks for this keeper recipe! I am wondering if this dessert is best served warm, or is it still just as delicious baked ahead of time (earlier in the day)? If it can be baked ahead of time, then I'll plan to make it for our Care Group this week! Jen - this cake definitely does not need to be served warm ... it's just as good completely cooled off. Im fact, it keeps well (covered) in the fridge for days. Does not dry out. I made this for Care Group last night - delicious!! Thanks for your many recipes that I use over and over again, Anneliese!! I have tons of fresh sour cherries - could I substitute fresh fruit (maybe macerated with sugar) for the pie filling? Thanks!